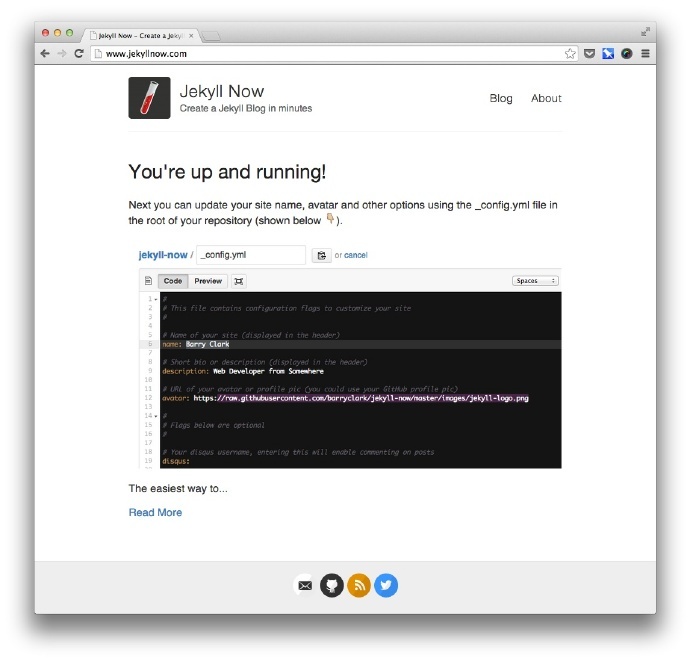 Jekyll Now makes it easier to create your Jekyll blog, by eliminating a lot of the up front setup. In a few minutes you’ll be set up with a minimal, responsive blog like the one below giving you more time to spend on writing epic blog posts! Fork this repo, then rename the repository to yourgithubusername.github.io. 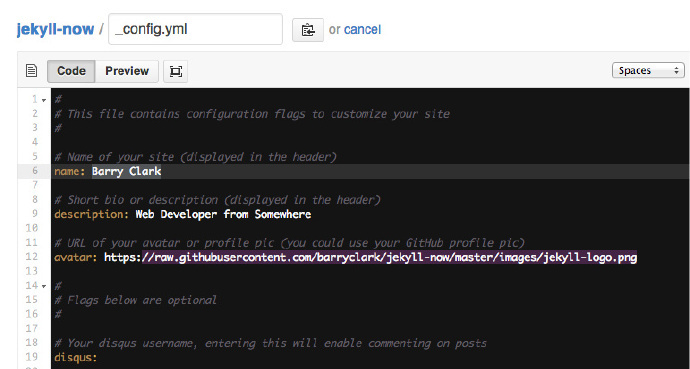 Enter your site name, description, avatar and many other options by editing the _config.yml file. You can easily turn on Google Analytics tracking, Disqus commenting and social icons here too. Edit files within your new username.github.io repository in the browser at GitHub.com (shown below). Use a third party GitHub content editor, like Prose by Development Seed. It’s optimized for use with Jekyll making markdown editing, writing drafts, and uploading images really easy. Clone down your repository and make updates locally, then push them to your GitHub repository. Edit /_posts/2014-3-3-Hello-World.md to publish your first blog post. This Markdown Cheatsheet might come in handy. Install Jekyll and plug-ins in one fell swoop. gem install github-pages This mirrors the plug-ins used by GitHub Pages on your local machine including Jekyll, Sass, etc. Commit any changes and push everything to the master branch of your GitHub user repository. GitHub Pages will then rebuild and serve your website. ✘ More time to code other things … wait ✓! Open an Issue and let’s chat! Jekyll - Thanks to its creators, contributors and maintainers. SVG icons - Thanks, Neil Orange Peel. They’re beautiful. Solarized Light Pygments - Thanks, Edward. Joel Glovier - Great Jekyll articles. I used Joel’s feed.xml in this repository. David Furnes, Jon Uy, Luke Patton - Thanks for the design/code reviews. Bart Kiers, Florian Simon, Henry Stanley, Hun Jae Lee, Javier Cejudo, Peter Etelej, Ben Abbott, Ray Nicholus, Erin Grand, Léo Colombaro, Dean Attali, Clayton Errington, Colton Fitzgerald, Trace Mayer - Thanks for your fantastic contributions to the project! Issues and Pull Requests are greatly appreciated. If you’ve never contributed to an open source project before I’m more than happy to walk you through how to create a pull request. You can start by opening an issue describing the problem that you’re looking to resolve and we’ll go from there.